Nationalism has become in vogue in Europe again. And, interestingly, there seems to be a correlation between Europeans who think their country should turn more inward and those who believe their nation’s influence has declined over the last ten years. 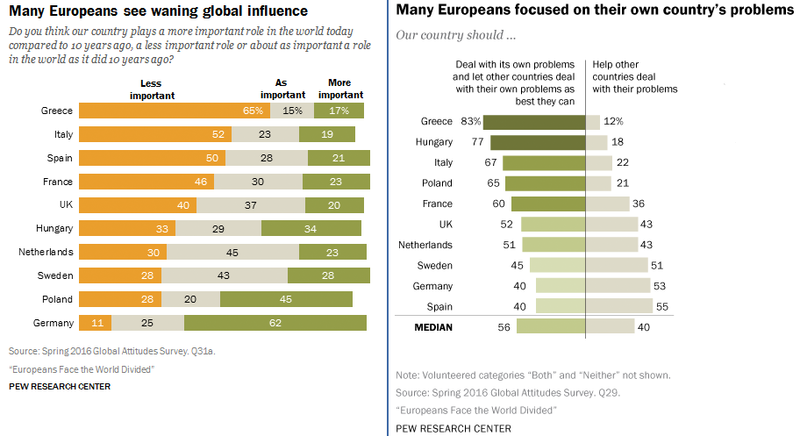 According to data collected by Pew Research, more respondents from Greece (65%), Italy (52%), France (46%), and the UK (40%) seemed to think that their nation plays a less important role in the world today compared to 10 years ago, rather than a more important role. Respondents from these countries were also highly likely to say that their nation should deal with its own problems and let other countries deal with their own problems as best they can — with Greece at 83%, Italy at 67%, France at 60%, and the UK at 52%. “Against the backdrop of perceived decline in global stature many Europeans are looking inward,” the Pew Research team wrote. This relationship between perceived influence and concern for other countries problems held in the opposite direction as well. Respondents from Germany (11%), Sweden (28%), and the Netherlands (30%) were less likely to think that their country’s influence has declined over the last decade, but were more likely to say that they should help other states with their problems. It should be noted, however, that only Germany and Poland think their country is more important today than a decade ago. 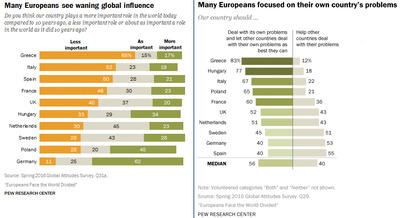 The only major outlier here is Spain, where respondents think that their nation’s influence has declined (50%), but were more likely than folks in Greece, Italy, and France to think that they should help other countries with their problems (55%).